Check boot for cracks. Replace if any damage is found. Check steering gear assembly housing for damage and scratches. Replace if there are any abnormal conditions. 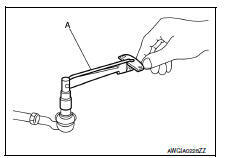 Hook a spring balance to the ball stud and inner socket measuring point (*) and pull the spring balance. Make sure that the spring balance reads the specified value when ball stud and inner socket start to move. Replace outer socket and inner socket if they are outside the specification. Swinging torque : Refer to ST-19, "Power Steering Gear". Make sure that the reading is within the following specified range using Tool. Replace outer socket if the reading is outside the specification. Rotating torque : Refer to ST-19, "Power Steering Gear". Check if steering wheel turns smoothly when it is turned several times fully to the end of the left and right. Check the steering wheel play, neutral position steering wheel, steering wheel turning force, and front wheel turning angle. Steering wheel play: Refer to ST-5, "Inspection". Neutral position steering wheel, steering wheel turning force, and front wheel turning angle: Refer to ST-5, "Inspection".